What to see in NP Kornati? 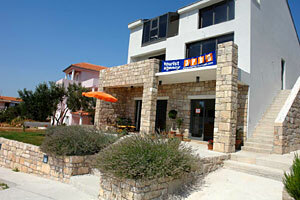 The tourist agency Arta is a new modern Croatian agency located in Murter, founded in 2003. It specializes in the Šibenik riviera region. It offers good services in renting private and hotel accommodation, boat rental, organization of excursions, making web-sites, selling souvenirs and property transaction services. Our mission is to be the best and most complete source of information in this attractive area, the part of the Mediterranean with the largest number of islands. In order to make it interesting for you and to bring this beautiful area into your homes, we have gathered a large number of information and made our own photos of it, so your arrival and the choice of accommodation, boats and excursions could be as easy as possible. Maps, information on towns, beaches and parties are some of the things presented, so you could take a virtual walk through Dalmatia and get to know their natural beauty, the people and their customs. The agency is located at the very entrance into the town of Murter. After you pass the sign "Murter", drive for another couple of hundred meters, and to your left you can see the bay of Čigrađa with a beautiful view of the Kornati islands, and to your right, along the road, you can see the agency Murter-Kornati Arta.